My university semester abroad was spent in southern France, and therefore I identify Provencal cooking as more “french” than say a Parisian steak frites. So for me, this week’s French Fridays with Dorie recipe, Pissaladiere, is just about as french as it gets. In Provence they are definitely not afraid of anchovies and the unsuspecting tourist may find them popping up in unexpected places. 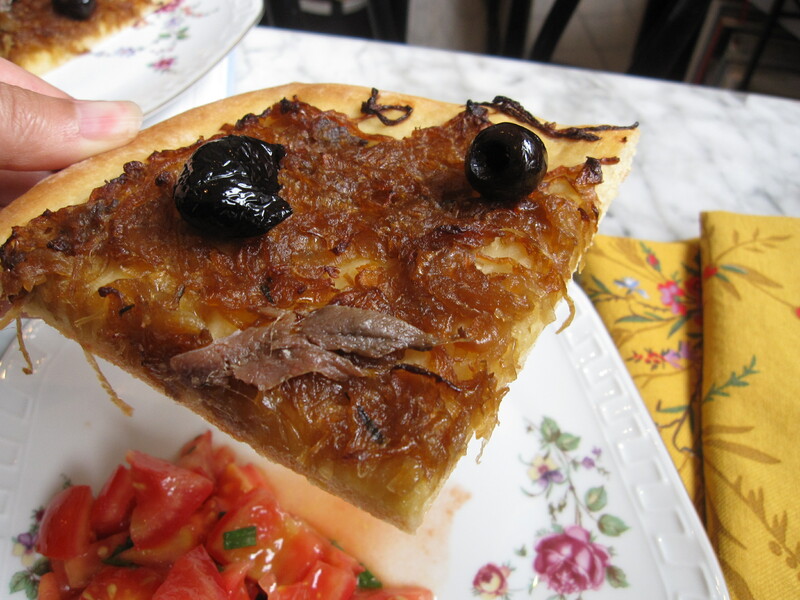 In Aix, where I lived, pizza ALWAYS came with a little anchovy in the middle, regardless of what the menu said. When I first arrived I hated anchovies and would always move the offending little intuder to the side and then bemoan the fact that it had already managed to flavor my pizza. But slowly, over time, the flavor began to grow on me and then became normal. Today, while I would not call myself an anchovy lover, I do believe that they have their place in certain recipes and this is one of them. Pissaladiere is sometimes mistaken for pizza on first sight, and the crust is certainly similar, but the toppings include neither tomato sauce nor cheese. 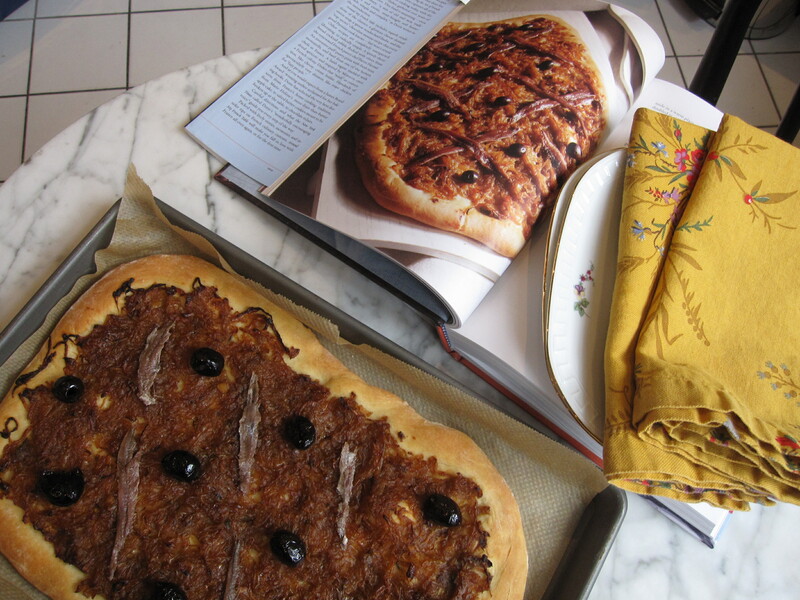 Instead, pissaladiere is topped with caramelized onions, cured olives, and anchovies. Having eaten my fair share of of these in France I was excited to give this recipe a try. While not difficult, this recipe does take a little time to get together because the dough needs to rise and the onions need to caramelize. In my experience, onions will not properly caramelize unless given time to do so and I get irritated with any recipe which tries to tell me otherwise. I recently read a recipe which called for the onions to be “sauteed over medium-high heat until caramelized, about 10 to 15 minutes.” Dorie tells no such lies in her recipe, advising instead to cook the onions for 45 minutes over low heat because, “this isn’t a job you should rush.” Bless you Dorie! But while I apparently have lots of opinions on caramelizing onions, I have almost no experience making pizza dough and I fear that I may have done something wrong with that piece of the recipe. While kneading it for the advised 5 minutes, I found the dough to be just crazy sticky and I think I ended up adding too much flour in order to be able to work with it. No idea if that was the problem or if it was something else, but my crust came out a bit dry in the end. Did anyone else have trouble with the dough or was it just me? I would welcome input from any of you who have more experience in this area. Aside from the crust being a bit dry though, both my husband and I really enjoyed our pissaladiere, which I served up for lunch with a light side salad. I can see this one being a tough sell in general and would probably be hesitant to serve it to guests; just a few too many controversial ingredients going on. But if I can get the dough figured out I could happily see whipping one up again for just the two of us. One final note, even as I type this my brain is already on vacation. Tonight we are hitting the road and heading to Croatia, one of my very favorite places in the world. My mouth is already watering just thinking about all the yummy food and wine. So many people associate Croatia and its cuisine with eastern europe, but the food is actually more closely related to the mediterranean diet, or I guess I should say adriatic, with lots of fresh seafood, olive oil, and pasta. I’ll tell you all about it when I get back, but in the meantime I’ll leave you with a picture of Rovinj, the town where we will be staying. Happy cooking and I look forward to catching up with all of your lovely stuffed pumpkin posts when I get back. I think the crust is supposed to be drier because it’s thinner, and if your dough had been too sticky in the first place, it woudn’t have risen. You’re right about the caramelization process, however in my case, my oven was too hot and my beautiful onions got slightly toasted anyway! Enjoy beautiful Croatia, you’re a lucky woman! Havea great trip! Re the dough, I DID NOT have trouble which is saying something in itself – normally yeasted doughs and I do not get along! I think it must have been luck! Yours looks exactly like Dorie’s and certainly a lot lett – ahem – rustic than mine! Looks delicious despite your sticky dough issue. I had to go a bit Italian and put olive oil on my hands to work with my sticky dough. Yours looks beautiful. I’m a little sidetracked by thinking about your trip… it sounds so wonderful! One thing I’ve learned recently about yeast dough is that they should be a little sticky. I used my food processor for mine, and it turned out beautifully. it’s really easy to add too much flour, especially when you are kneading by hand. One thing I should do, but have not yet started to, is to weigh my ingredients – that takes care of some of the atmosphere issues… at least that’s what I’m told. I enjoyed the pissaladiere as well .. as did my family. It’s a perfect snacky lunch. My dough was a little sticky, too, but I thought it was because I used spelt flour. I usually have to add more spelt flour than I would normal flour. 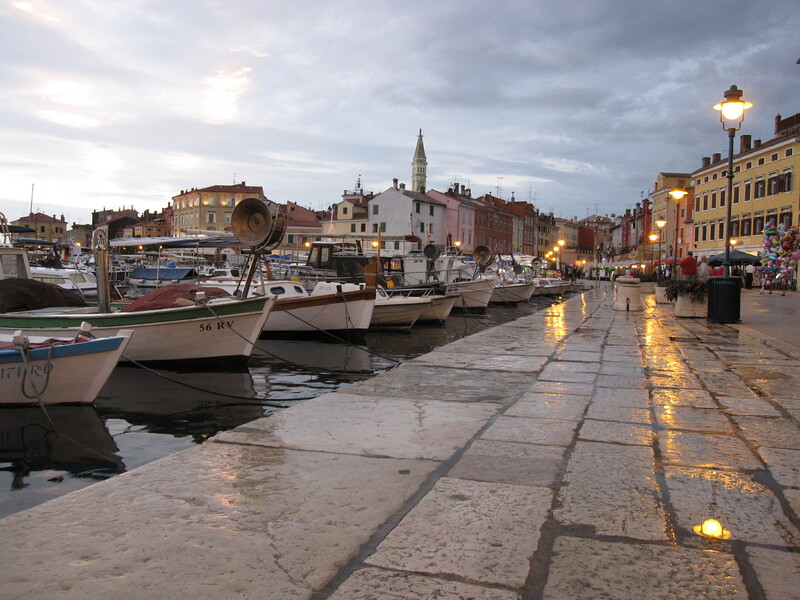 The photo of Rovinj is absolutely beautiful. Just beautiful. Enjoy your trip. I hear Croatia is beautiful! I hope you have the most fantastic time! Your pissaladiere looks great! Yeasted doughs can be a difficult beast – every second loaf of bread I attempt turns out too dry. Enjoy Croatia! So how did the pissaladiere compare to what you ate in the south of France? I found the dough to be pretty sticky too. I cheated and kneaded mine in my Kitchenaid mixer! Have a wonderful time on your vacation – that looks like a lovely town! Have à great trip to Croatia. Nice country, probably better weather right now. Your pissaladiere looks great. My dough was a bit sticky too! I just added a bit of flour as I kneaded it. Yours looks just like the photo in the book! Great job! What a beautiful little town…enjoy your vacation! Really enjoyed your post! My dough was probably the stickiest dough I’ve ever made. Hope you have a great holiday in Croatia! I felt the same way about the crust dough as you did. Unfortunately I didn’t roll it as thin as I should have and had some puffy yet dry edges. Have a wonderful time in Croatia! Your version looks beautiful! I found I had to add a bit of flour as I kneaded, but I didn’t find the crust dry. As Cakelaw said above, yeasted doughs can be a bit fickle sometimes. Have a fantastic vacation! My dough was a bit sticky, but I still could work with it. The crust did seem a bit dry and I wondered if it would have been better to brush it will olive oil before baking. Your pissaladiere looks beautiful. Have a fabulous time in Croatia! It looks great & I hope you have a wonderful trip! I didn’t have time to make the yeasted dough, so I used puff pastry. I enjoyed this tart tremendously. I agree that it wouldn’t work for most guests with those controversial ingredients. I can’t wait to hear about your trip to Croatia. It sounds like a lovely place. be sure to tell us about all the wonderful Croatian food you eat – I love seafood! What a great post! People like anchovies more than they think they do I think. A mashed up anchovy filet is my secret ingredient in MANY a dish at my house. My guests who tell me they don’t like them have unsuspectingly eaten quite a few…. Loved your post- too funny reading about how in Provence the anchovies were “snuck in” to dishes. Nana and I were in Aix just a few weeks back. Although once you get home – it now seems like so long ago 🙂 Your Pissaladiere turned out just stunning – well done all around. And I am so excited by your tales of a Croatia vacation. I seriously hope you will share some photos and tidbits when you are back and have caught up. Enjoy !!! you were right to add more flour… when making bread if the dough should be tacky and not sticky, then i add a little at a time, just to coat the surface while i knead it until it becomes the right consistency, but even with all the precaution taken with making the dough, this recipe turns out dry pizza dough everytime since we first made it for this recipe. I think its just the nature of the dough. if you left out the egg and let it ferment and rise in the fridge overnight I bet it would be a bit softer and more airy, less dry you know? Thanks for all the feedback, I really appreciate it. Sounds like I just need more practice with yeast dough… and maybe a bit more patience. I will be sure to post some pictures of our trip, we had such a great time!